A preview of tonight's Toronto/NewYork Islanders game. Both teams won their last games. 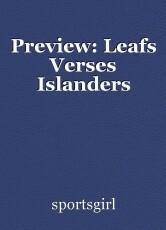 The New York Islanders, however, are not going the same direction as the Toronto Maple Leafs. The Islander's 4-3 win against the Ottawa Senators was just their third win in 17 games. The Islanders have just won back to back games just three times this year. As for the Leafs, their 4-3 win on Wednesday night broke the franchise record for wins in a season (read "Leafs Break Franchise Record With 46th Win). The Leafs are a point away from reaching 100 in the standings. This page was created in 0.4062 seconds.